Find keywords that smell terrific. Because they’re your book’s perfume! What are keywords? They’re the words you use to describe your book. Sometimes you’ll hear them called keyword phrases, but that just means keywords that are more than one word long. For example, “hero” is a keyword and “android hero” is a keyword phrase. In fact, every site with media wants them. But why is it so important to find keywords for your book? Keywords are a primary way for a store to understand what your book is about. When you give your book a keyword, you’re giving it an identity. After all, “detective” paints a different picture in your head than “cooking.” Keywords are beacons, pings, scents that get picked up by search engines, recommendation bots and, oh yeah… readers. Keywords are like perfume. If chosen wisely, they make your book more attractive to the right folks. The kind of folks who are so totally into you (and your book). So how do you find keywords to use for your book? How do you find keywords that will help your book get visible on the online stores? 1) Be specific and be honest. Use words that truly describe your book, not what you think will be popular. And when you choose the keywords, use specific terms like “android hero” instead of “hero”. This will help the book get spotted by folks with specific tastes. 2) String a couple of words together to make a short, clear phrase. So use “mystery series for kids 9-12” instead of just “kids mystery”. These keyword terms will map well with what customers actually type into the search bar when they’re looking for a book. Go to the online bookstores where you sell your book. Type in one of the words you chose for your book. Notice the window that drops down? Those are suggestions for readers to make their search easier. But it’s also list of suggestions for authors trying to find keywords for their book! Scan the list of terms in that drop-down menu. Click on the first one that truly applies to your book. Do you like the results you see for that term? Do those books look like your competition? Then use that term! It applies to your book and it’s popular enough to appear in the drop-down menu — so go for it. 4) On Amazon, be sure to use all seven keywords or short phrases. Separate them by a comma. 5) Be sure to use your keywords in the book metadata AND in the book description. If the scent fits, then wear it everywhere! The more you use appropriate keywords on your book’s sales page, the better your chances of connecting to the right customer. Keep these five tips in mind while you’re prepping your book for sale. 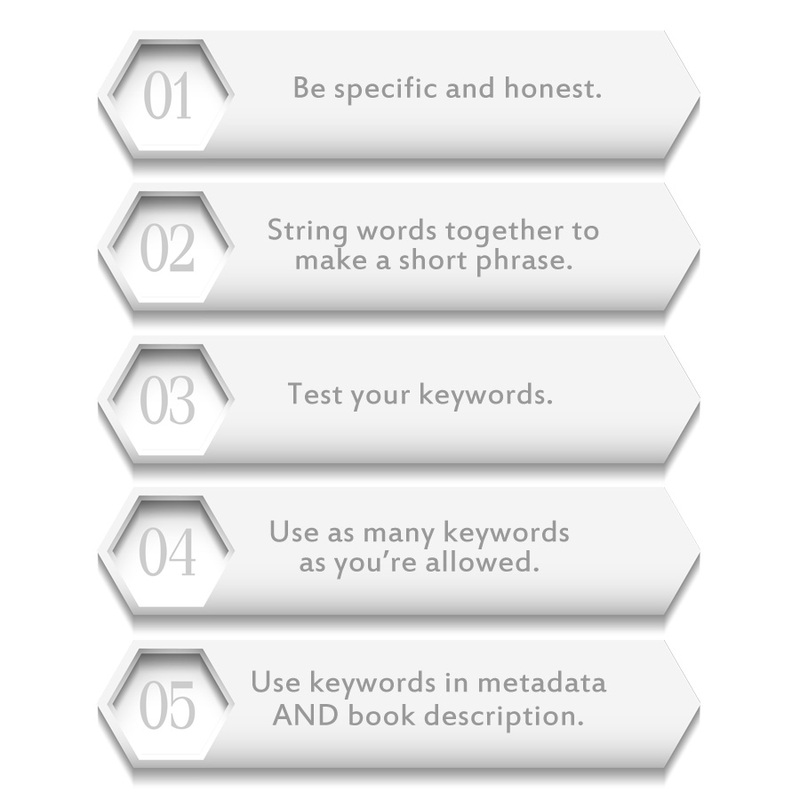 You can also follow these tips if you want to find keywords for your existing books. I’ve seen Shirley Link & The Safe Case climb up two popular lists on Amazon just by tweaking the keywords after launch. You can’t be everything to everybody. That’s a recipe for failure. So choose your scent and find your book lovers! As always, I love your work, Ben. You’ve inspired me to get in there and have another go at my keywords. Awesome tips. Thanks for your wisdom. Thanks for the kind words! I’ll be moving all of my marketing tips posts over to TheAuthorHelper.com soon. Look for more new material over there.